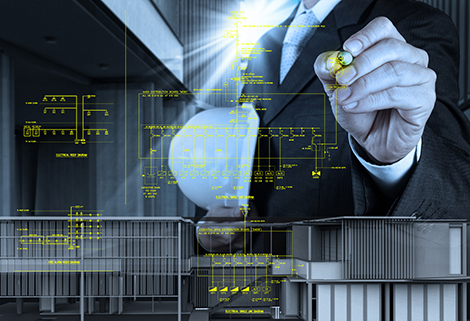 We are at your disposal in the area of electrical engineering and automation planning, including programming and documentation. Our listed services are customer-focused and will be implemented and selected individually. We get the most out of synergies from the experience in the individual areas and offer system-independent and comprehensive solutions for our clients. We are proud of our comprehensive service concept, which always meets with great interest with manufacturing companies as well as machinery and special machine-building companies and companies in the electrical engineering / automation technology fields. We work together with the most innovative companies in the industry to offer you the best solutions using the latest technologies. Project Management: We plan, organize, control and monitor your projects according to your requirements or visions. Planning and Development: Various instruments (e.g. CAE / CAD systems, system views, etc.) are used to make transparent the actual and target states and optimization approaches are detailed. Documentation:We create all the documents needed for the production and the maintenance of a plant (circuit diagrams, layouts, logic diagrams, etc.). Project Development:We offer system independent process and module developments as a service. Programming and Industrial Automation:We program complex machine processes and control processes according to your needs.